I worked a few more samples of this stitch. 1.The long and short versions are alternated in the first sample. the second sample is worked with varied widths, the stitch is widened by taking in the fabric while working the central buttonhole stitch. 2.One side of this stitch worked differently on these samples. In the first sample three buttonhole stitches are worked with a half cretan stitch.One side is extended with detached chain stitches in the second sample.One side is whipped in the third sample. 3.French knots , pistil stitches and detached chain stitches are worked with this stitch in the first sample. 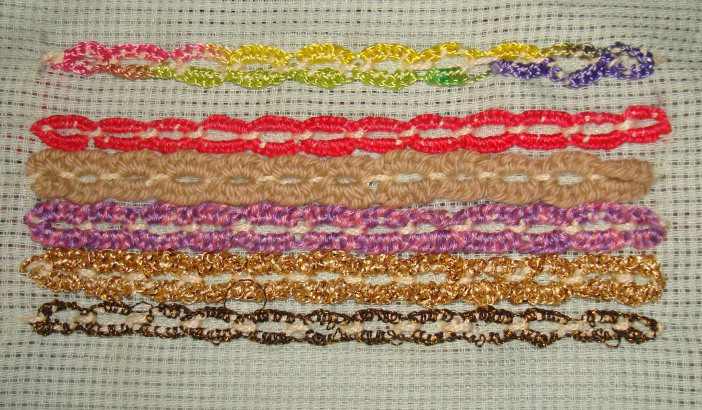 Isolated buttonholed cable chain stitches are worked in these set of samples. 2.With two straight stitches in the end. 6.The first part was woven and the second part buttonholed. This week’s stitch on TAST 2014 challenge by SharonB is buttonholed cable chain stitch. The working of this is on her blog. A new stitch for me. I am taking online class on encrusted crazy quilting with her. Working on these stitch samplers will actually help me as reference later. 1.In these few samples I was experimenting this stitch with different threads. The base thread was knitting cotton from anchor. 2. The first sample is worked in a curve. Zigzag version is worked in the second sample.